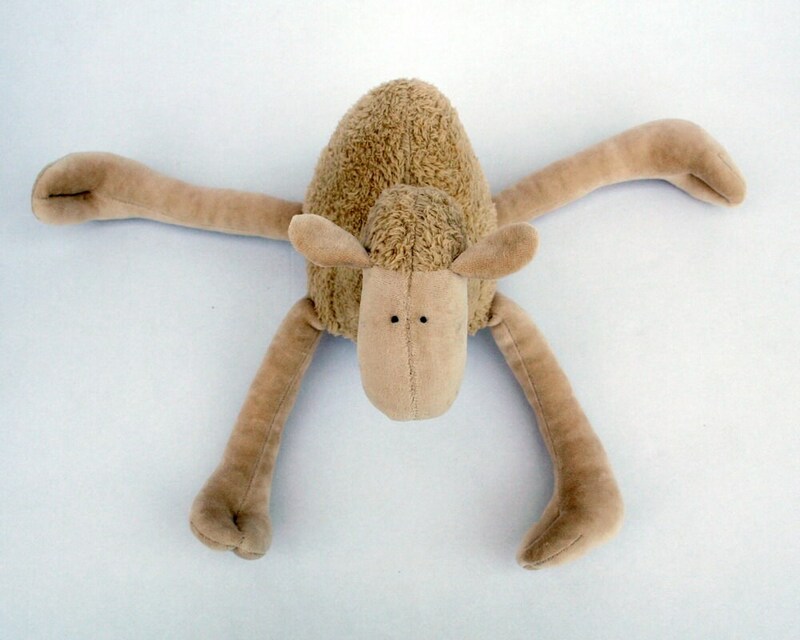 Cuddly soft plush Camel made of soft and furry beige plush. This camel just arrived from the desert where he worked for a caravan, carrying salt to Timbuktu. Now he is calm and relaxed, and ready for a new trip to your home. 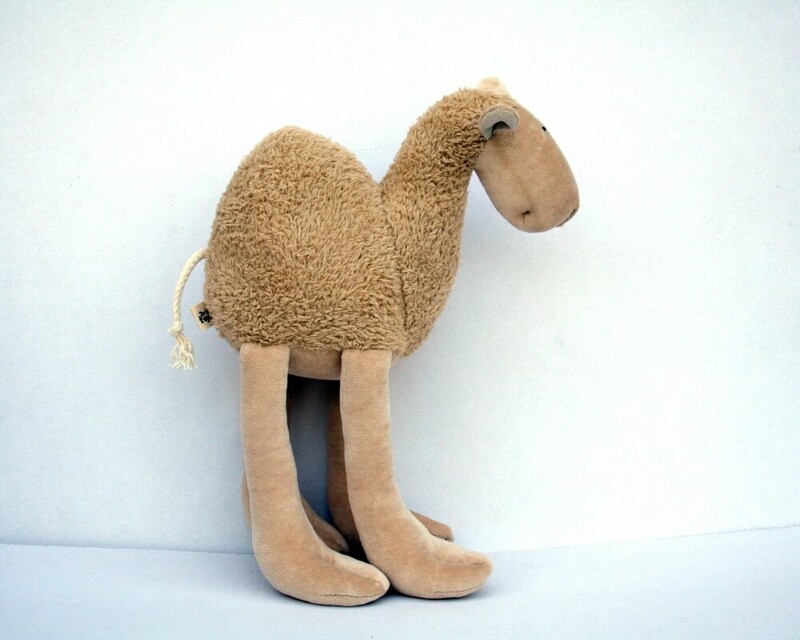 The Camel is 14" from head to toe (however he can't stand alone) and 10" from nose to tail. Eyes are embroidered, the tail is made of cord. Safe for babies, no dangerous objects or loose parts. Machine washable. In the Arab world, camels have long been given names. There are names for female and male camels, and names common for both genders. "Ibil" and "Hijen" are the most common names given to both genders and camels of all sizes. From these, new names branch out according to the size, development stage and characteristics of the camel. "Al Fahl" is a common name for male camels, referencing their procreative powers. "Addawser" is given to camels that are big in size. 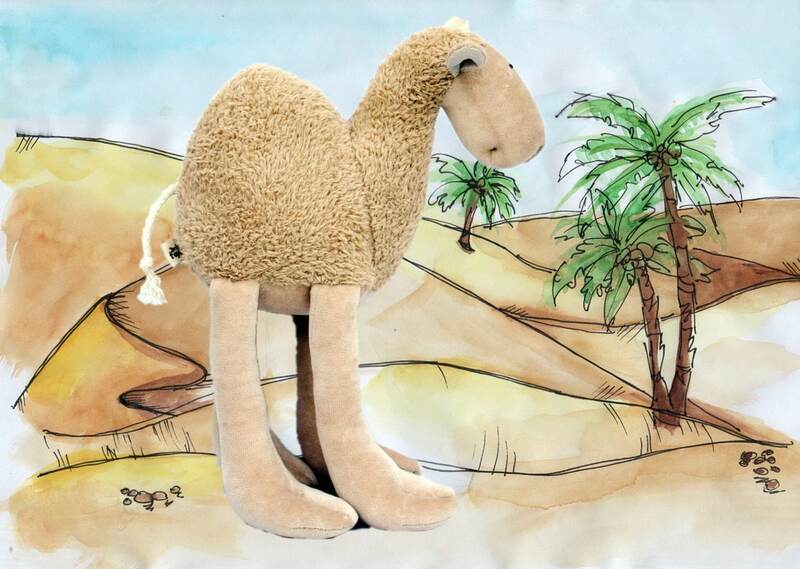 "Al Haml" is for camels that wander around the desert without a master, and "Al Midifaa" is given to camels that have a lot of fat and woolly skin. Female camels have many more names than males. "Al Bikra" means a virgin, so it is for camels that haven't mated. "Al Hail" is for camels that have mated but never carried a baby. "Al Ashraa", which means 10, is a name given to a camel that is pregnant to the 10th month. If a camel has given birth prior to her due time, she is called "Al Saood". Baby camels are called "Al Heeran" or "Futtaim" if they are still nursing after their first year. "Al Mataya" or "Al Rahila" is a name given to a young camel that people can ride. 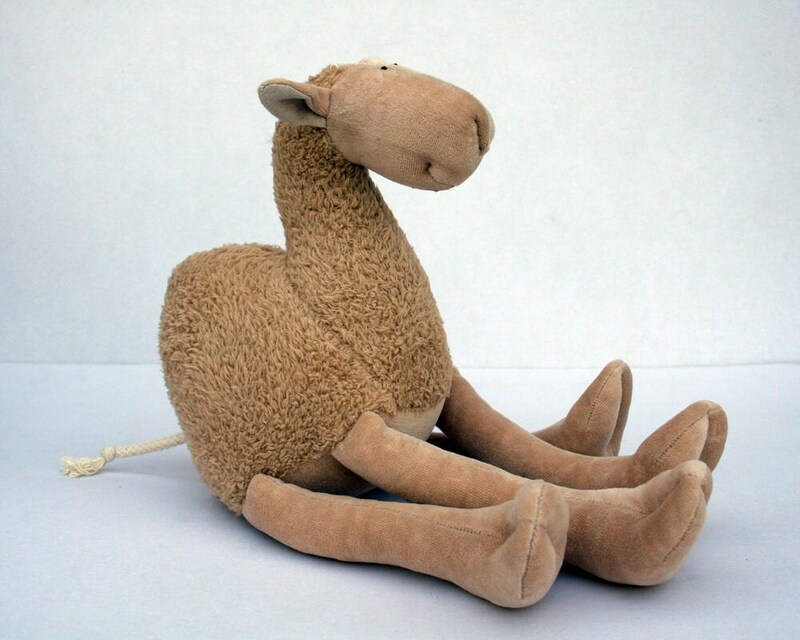 "Al Shamlal" is for a camel that is light and fast, and "Al Sharif" is for a camel that is old, tired and slow. • "Al Gasreed" - when a camel does not drink much water. • "Al Ghab" - when a camel drinks once every two days. • "Al Rabea" - when a camel drinks every three days. • "Melwah" - when a camel is always thirsty. • "Al Riffa" - when a camel drinks water at any time. Many specialists agree that there are more than 1,000 camel names, and names can differ from country to country. Even though it may be hard to keep up with them all, it is fascinating to know that camels are not named randomly. Even specialists admit they have more to learn about camels. Love this camel. It's perfect in all ways. As always your animals are awesome! They will be very welcome Christmas gifts. Thank you so much! First of all, it's adorable and cuddly. Secondly, it is extremely well-made with no disappointing surprises. It's just as pictured and described. Nice doing business with Andrea. Great product, super cute and unique! High quality craftsmanship. Great service and communication. 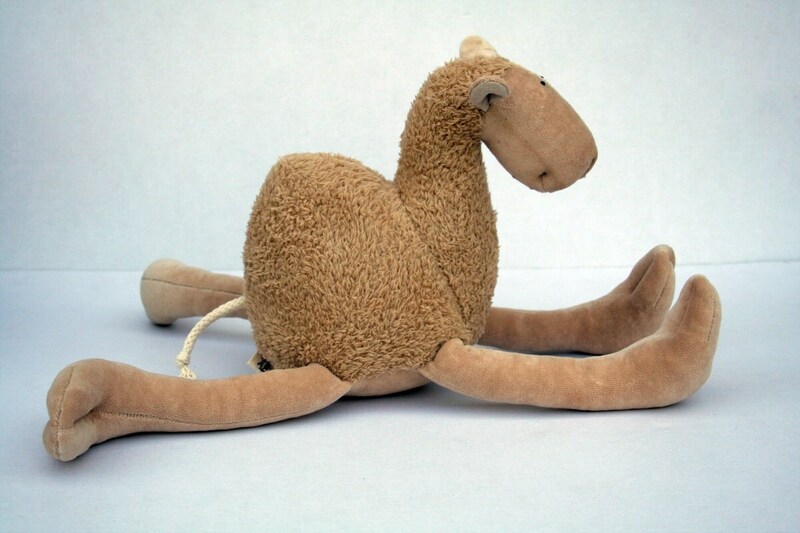 My Daughter LOVES her new camel and special touches like the suggestions for naming camels make it all the more special! You will not be sorry if you order from andreavida!